Goomagz Blogger Template especially comes for those. Who are looking for professional looking theme for blogger blog. If you own a site related to Technology and looking a unique theme for your blog. Then Goomagz blogger template is going to be your first choice. Because it comes with SEO ready design and many other advanced features. That you may not be able to find in any free theme on the web. 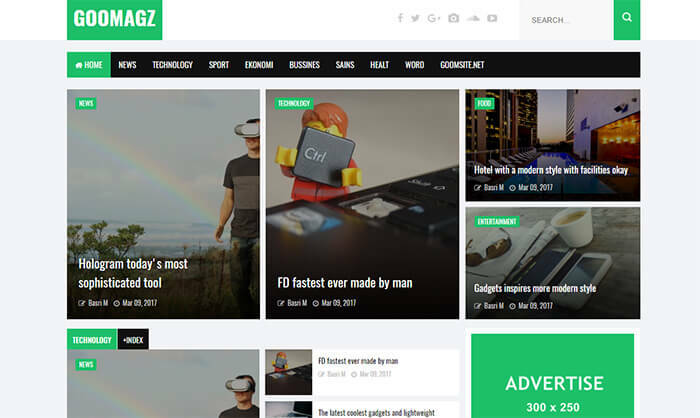 One another biggest advantage of using Goomagz blogger template is that. It will increase the speed of your blog. Means if you are already using an ordinary looking them and your site pages will take time while loading. Then this theme will help you to solve this issue. As you know that speed of site matter a lot. While we are going to rank your site in search engines. So by using this template, you will enjoy amazing fast speed. You can take a look at the demo version of this template. You can see that each feature of this template is unique. It has separated boxes that can be used to display specific content on your website. It means that if you have a multi-niche blog then by using these boxes. You can assign different categories to your blog content. This template also comes with responsive design. So your loyal readers can access is from different devices.